The Rev. 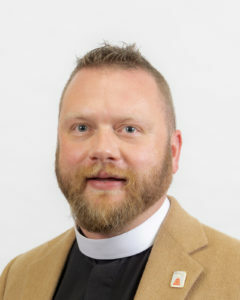 Christopher Rodgers will be ordained a priest at 7 pm on Thursday, December 6, at the Episcopal Church of Wichita Falls at St. Stephen’s Episcopal Church by Bishop Scott Mayer on behalf of Bishop George R. Sumner, Episcopal Diocese of Dallas. A reception will follow. Rodgers was ordained a deacon by Bishop Sumner on June 2, 2018, at St. Matthew’s Cathedral, Dallas. His sending parish is the Episcopal Church of the Transfiguration, Dallas, Texas. He became clergy in charge in Wichita Falls on July 1. Before discerning a call to the priesthood, he served in numerous lay leadership roles including, but not limited to senior warden, budget and finance chair, catechist, Sunday school teacher, altar emcee, thurifer, acolyte, Eucharistic minister, and Eucharistic Visitor. He holds a Bachelor’s degree in Historical Studies, a Bachelor’s degree in Government & Politics, a Master’s of Public Affairs, and a Master’s of Science in Applied Economics, all from the University of Texas at Dallas, where he was a research, teaching, and editorial assistant as well as being a PhD candidate in Political Economy. Prior to attending Virginia Theological Seminary, he worked in a variety of senior financial, economic, and fraud analysis roles for Fannie Mae, GM Financial, the Federal Reserve Bank of Dallas, and the United States Government Accountability Office. Wichita Falls is his hometown as well as that of his wife, Jennifer.